4 Bdrm Detached Dwellhouse. Ground flr: Hall. Cloakrm with wc. Lounge. Kitch/Dining area/Family rm on open plan. Utility rm. 1st flr: 4 Bdrms. 2 with ensuites. Bathrm (CT band - F). Garden. Double Garage. Parking. Price over £385,000 Entry by arr. Viewing 07905 132716. (EPC band - B). 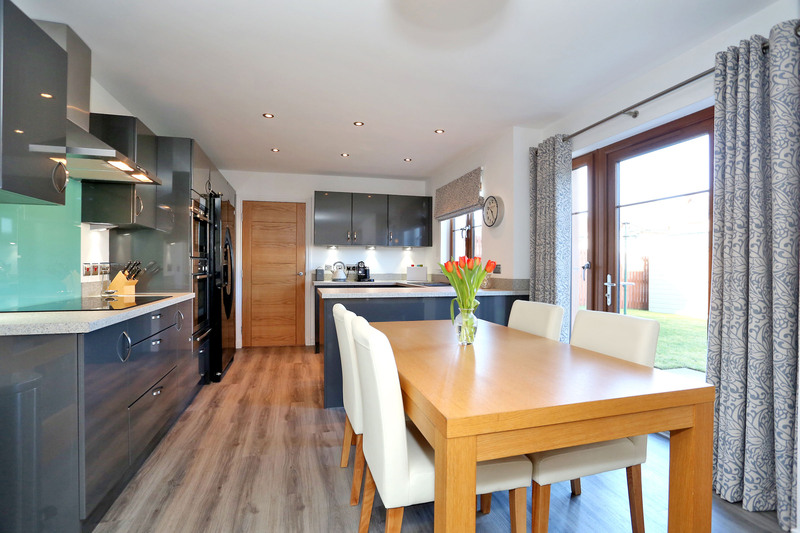 This immaculately presented Deveron Homes 4 Bedroomed detached dwellinghouse, is decorated neutrally thoughout. There is spacious bedroom and living accommodation and the property benefits from Gas central heating, full double glazing and golden oak uPVC windows throughout. It is an ideal commuter base for Inverurie, Westhill, Dyce and Aberdeen. There is a large garden to rear, and completing the package is the spacious integrated double garage. Early viewing is highly recommended to see all this property has to offer. 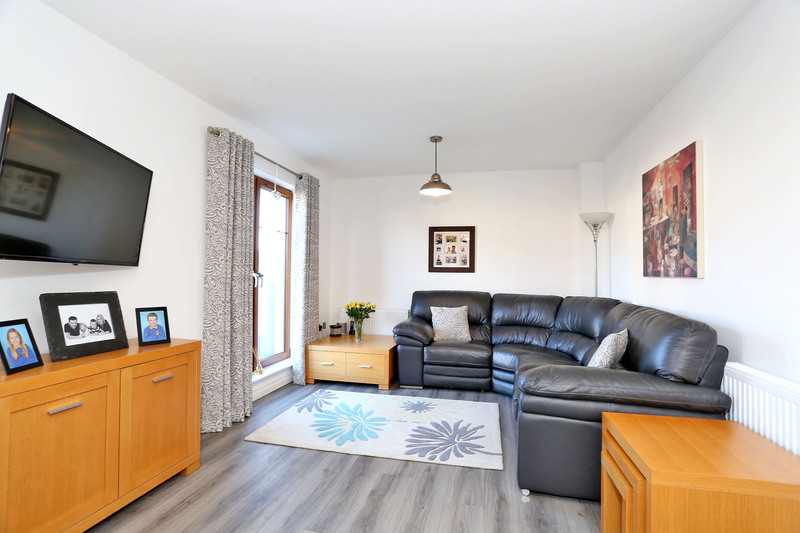 Location: Kemnay is a popular village within easy commuting distance of Aberdeen, Dyce and the Airport and the new Prime Four site at Kingswells. 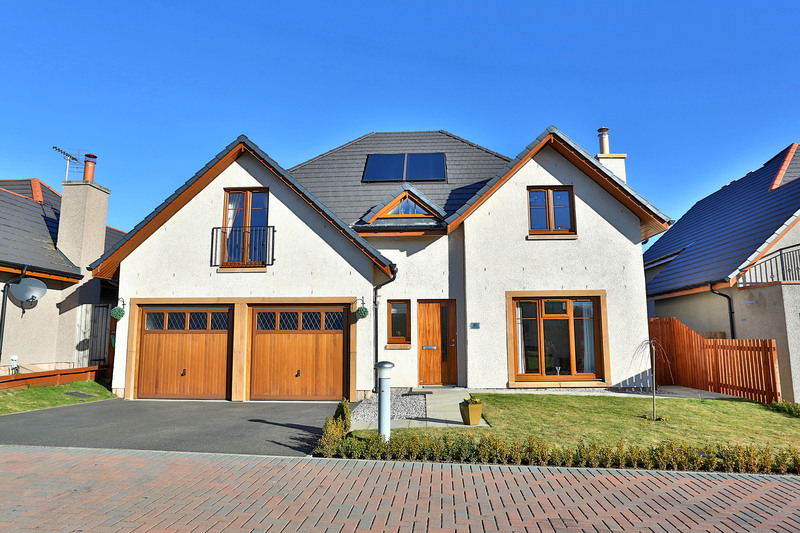 The village itself offers a range of local amenities including shops, primary and secondary schooling, a medical centre, tennis courts and an 18 hole golf course, whilst a wider range of facilities are available in the nearby town of Inverurie. Aberdeen city centre lies only 15 miles away. Directions: From Inverurie take the B994 to Kemnay. Once in Kemnay take the first road on the right into Fyfe Park. Continue along this road and take the first right again into Stuart Crescent, turn immediately left and number 40 is located along here on the right hand side clearly identified by a Peterkins For Sale sign. Entrance Hallway: Downstairs the part opaque glazed front door leads into the entrance hallway. 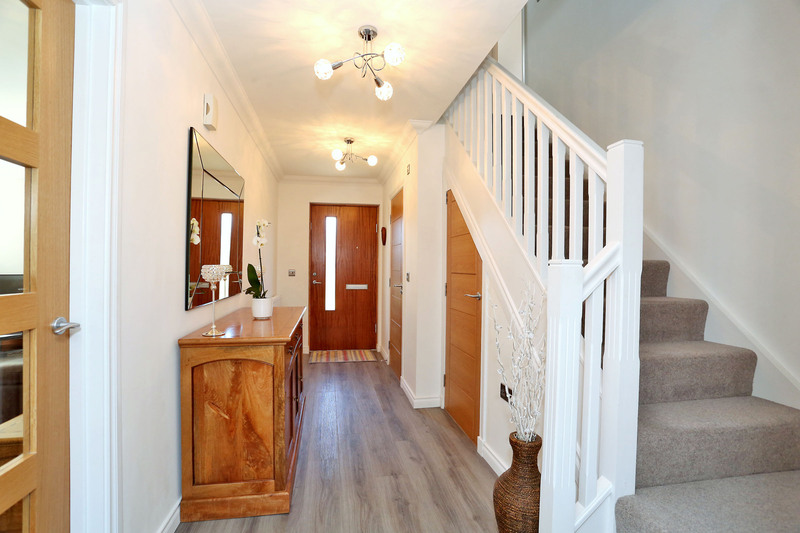 The entrance hallway is bright and spacious and gives access to the lounge, dining kitchen, family room and the carpeted stairwell to upper floor. 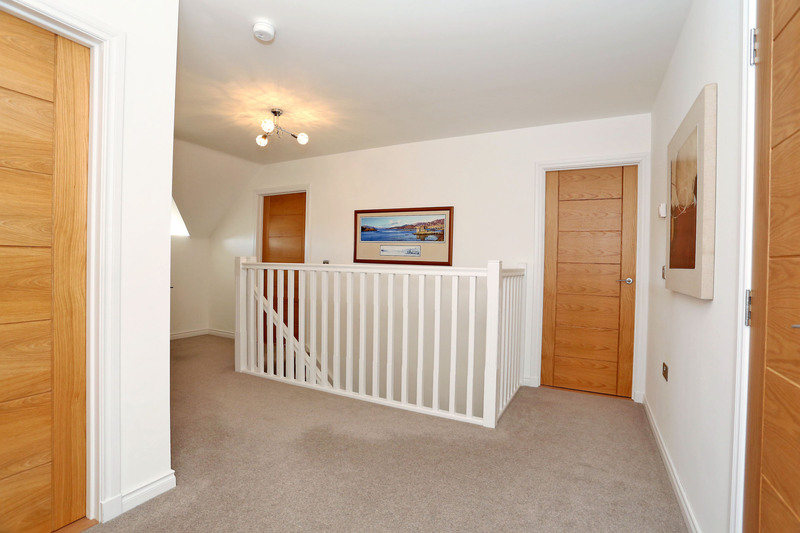 The hallway also gives access to the understairs cupboard which has coat hooks and is a great storage space. Neutral décor, ceiling light fitments and ‘Moduleo’ wood effect laminate flooring. Cloakroom/W.C. : Door gives access from the hallway into the downstairs W.C. Opaque window to front with roman blind. Decorated neutrally. 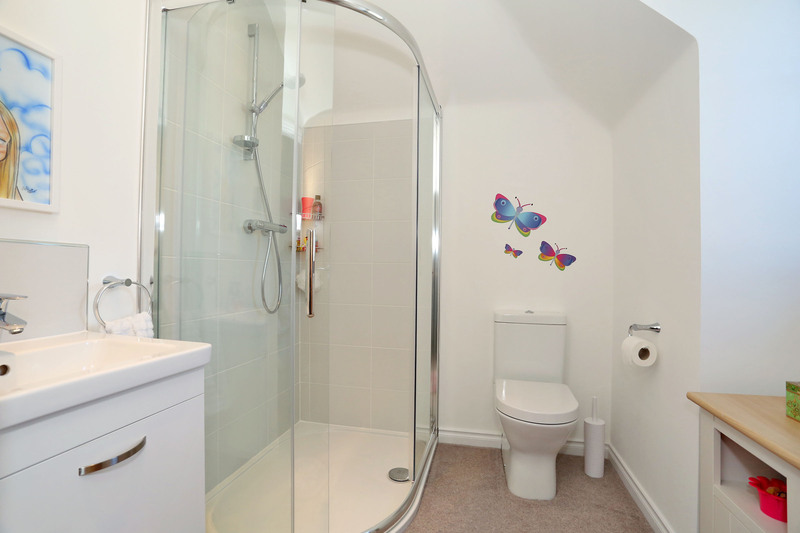 Fitted with a white two piece suite comprising semi pedestal wash-hand basin and W.C. Brushed chrome fitments. Tiled splashback behind wash-hand basin with mirror above. Chrome ladder style heated towel rail. Ceiling light fitment. Extractor fan. ‘Moduleo’ wood effect laminate flooring. Lounge: 17’11” x 11’7” (5.46m x 3.53m) The lounge is located to the front of the property with large triple window flooding the room with natural light. Full length curtains. Television and telephone points. Neutral décor. Ceiling light fitment. Coving. Neutral coloured carpet. This is a well proportioned room with ample space for a range for furniture. Kitchen/Dining/Family Room: 29’6” x 10’8” (8.83m x 3.25m) The kitchen/dining room/family room are on open plan and run along the back of the property. The kitchen is fitted with a range of wall, base and drawer units, with grey gloss frontals and granite effect laminate worktop with co-ordinating upstands. Single bowl ‘Blanco’ sink with mixer tap and drainer. Window overlooking the rear garden with roman blinds. Space for stand alone American style fridge freezer. Double built-in ovens; one is a microwave combi oven, ‘Neff’ ceramic hob with chrome chimney style extractor hood above, glass splashback behind, plate warmer, integrated fridge, co-ordinating plinth below, ‘Moduleo’ wood effect laminate flooring. The kitchen has neutral décor, ceiling downlights and under unit lighting. Dining/Family Room: The dining area has ample space for a large dining table and chairs. 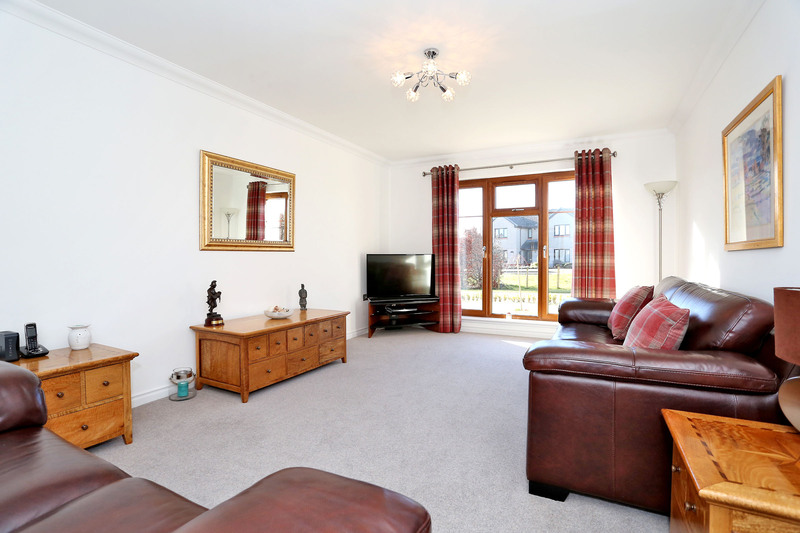 The family room has ample space for a range of furniture. Telephone and television points. Decorated neutrally. 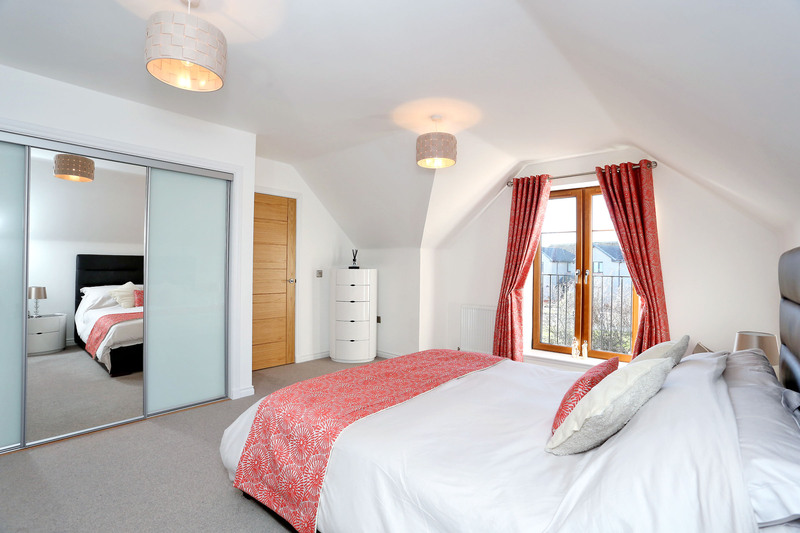 The room is filled with light from the full height windows and French doors both with curtains. Ceiling light fitments in the dining and family room areas. ‘Moduleo’ wood effect laminate flooring throughout. 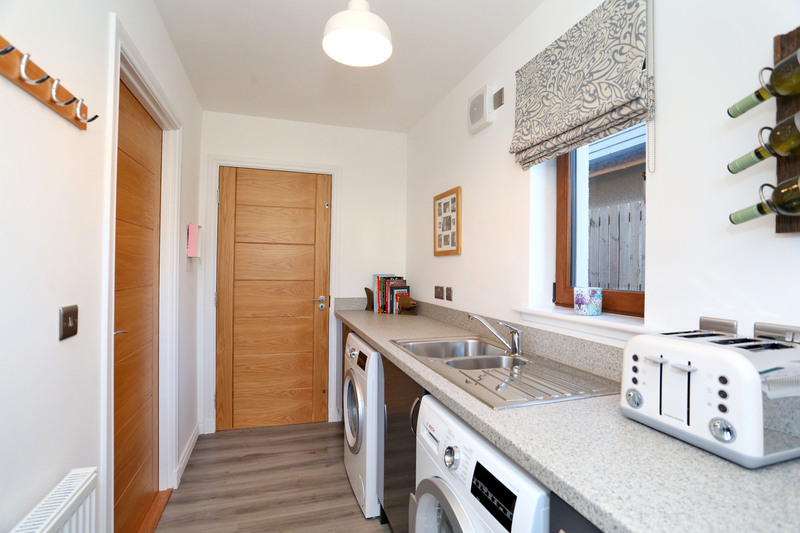 Utility Room: 10’11” 4’9” (3.32m x 1.44m) The utility room is fitted with base units in the same range as the kitchen and granite effect laminate worktop. 1½ bowl stainless steel sink with mixer tap and drainer. Window to side with roman blind. Ceiling light fitment. Extractor fan. Plumbed for washing machine and tumble dryer. Coat hooks. ‘Moduleo’ wood effect laminate flooring. Stairs to upper floor: The upper floor is accessed via a carpeted stairwell. 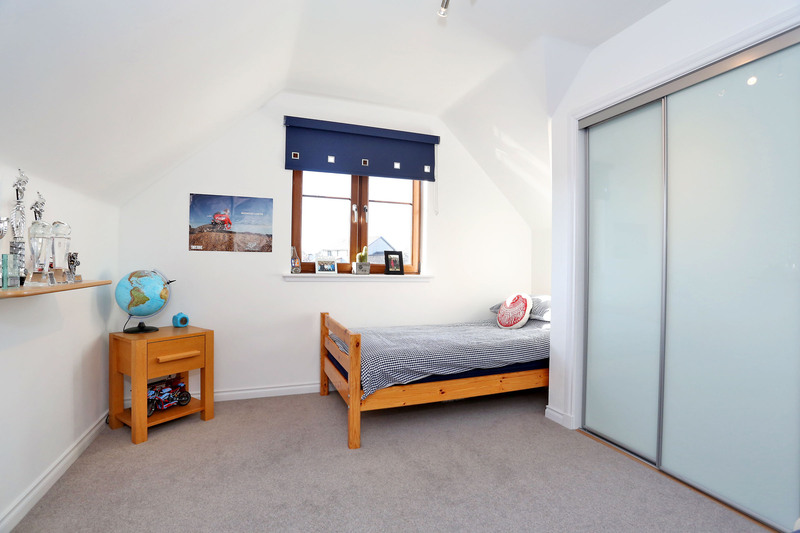 Access is given to all bedroom accommodation and family bathroom and has ceiling light fitments, smoke detector, and access hatch to loft. There is a lovely feature window to the front which provides natural light. 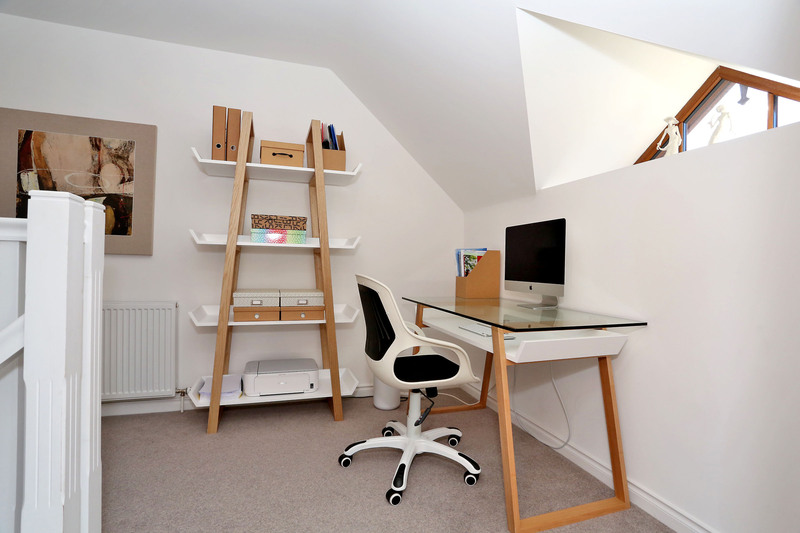 The upper hallway is extremely spacious, enough so that it houses the computer desk etc. Neutral décor. The hallway also gives access to a large shelved storage cupboard ideal as an airing cupboard. Master Bedroom: 16’2” x 14’2” (4.92m x 4.31m) The master bedroom is located to the front of the property with full height double windows with wrought iron balcony and curtains. Double ceiling light fitments, telephone point. The master bedroom is decorated neutrally. There is ample space for a large King size bed along with a range of freestanding furniture. Triple sliding door wardrobes provide lots of storage with shelf and hanging rail, two of the sliding doors are opaque and one is mirrored. Neutral coloured carpet. Master En-Suite: Door gives access from the master bedroom into the master en-suite which is fitted with a white two piece suite comprising wash-hand basin on a vanity unit with drawer below and W.C. There is also a large curved shower cubicle with mains fed shower. 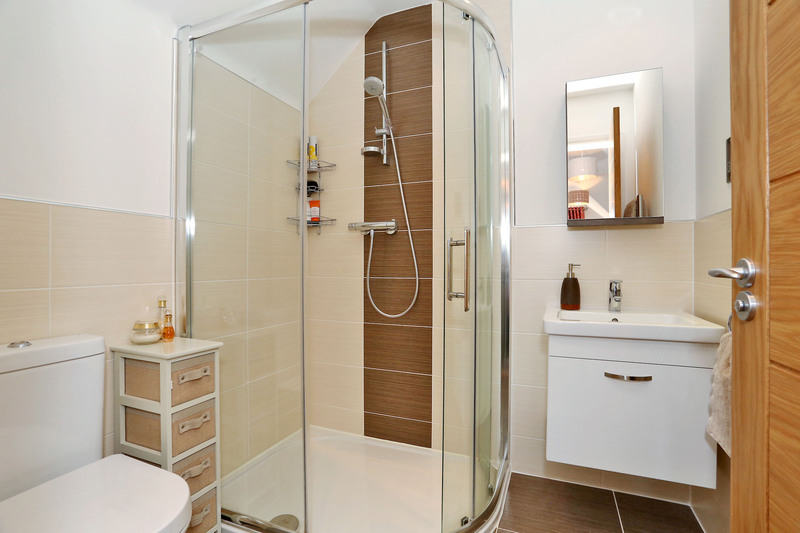 Tiled to full height in shower cubicle area and to dado height in the rest of the room. Chrome fitments. Mirrored vanity unit above wash-hand basin. Shaver point. Chrome heated ladder style towel rail. Tiled flooring. Bedroom 2: 10’9” x 10’8” (3.27m x 3.25m) The second bedroom is located to the rear of the property with full height windows with balcony. The bedroom is decorated neutrally with ceiling light fitment, telephone point. There is a triple sliding door wardrobe with shelf and hanging rail, there is one mirrored door the other two are opaque. Neutral coloured carpet. Ample space for double bed along with freestanding furniture. Smoke detector. En-Suite: Door gives access into the en-suite fitted with white two piece suite comprising wash hand basin and W.C. Tiled splashback behind wash hand basin with drawer and vanity unit below. Tiled to full height in shower cubicle. Shower has mains fed shower. Opaque window to rear. Chrome fitments. Chrome heated ladder style towel rail. Wall hung mirror. Ceiling down lights. Neutral coloured carpet. Bedroom 3: 11’7” at widest x 11’5” (3.53m x 3.47m) The third bedroom is located to the front of the property and has window with roller blind. The room is decorated neutrally and has television point. Double built-in wardrobe with opaque sliding doors. Ceiling light fitment. Neutral coloured carpet. Bedroom 4: 10’7” x 9’7” (3.22m x 2.92m) The fourth bedroom is a guest bedroom which is located to the rear of the property. Window overlooking the rear garden with roman blinds, double door built-in wardrobe with shelf and hanging rail. Decorated neutrally. 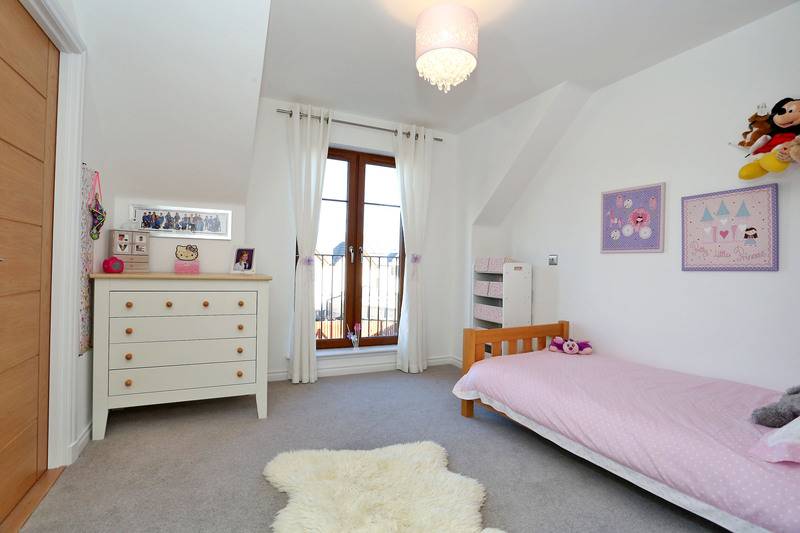 Ample space for a large double bed along with freestanding furniture. Ceiling light fitment. Neutral coloured carpet. 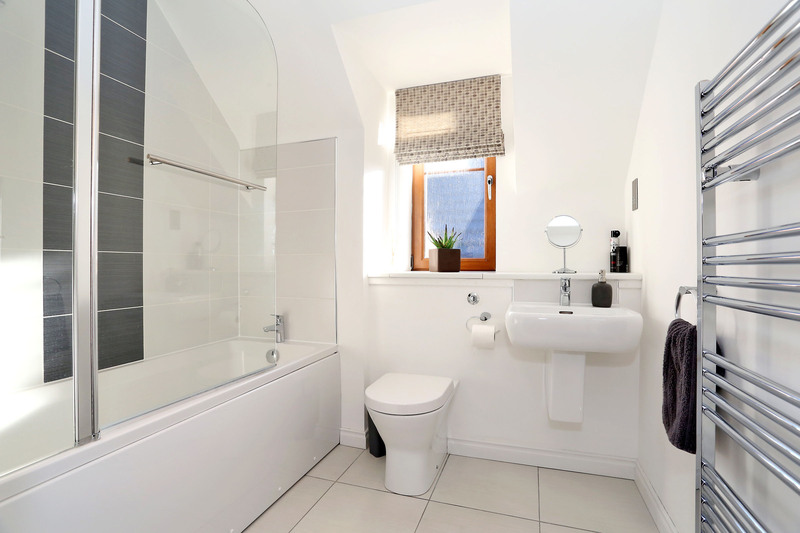 Bathroom: 7’2” x 7’0” (2.18m x 2.13m) The family bathroom is fitted with a white three piece suite comprising wall hung semi pedestal wash-hand basin with tiled splashback. Concealed cistern W.C. and bath. Tiled to full height in bath area with mains fed shower above bath. Glass shower screen. Chrome fitments. Neutral décor. Ceiling downlights. Extractor fan. Opaque glazed window to side with roman blind. Chrome ladder style towel rail. Shaver point. Tiled flooring. Outside: To the front of the property there is an area of lawn and driveway with parking for two cars, electrically operated garage doors give access to the extremely spacious double garage. The garage houses the central heating boiler and water cylinder and is plumbed for additional washing machine. Benefiting from power, light, and a television point. There is also a work bench to the rear and coat hooks. Garage can also be accessed from the utility room. The rear garden can be accessed from the utility room, the dining/family room or via a gate at the side of the property. Path leads to the rear garden which is mainly laid to lawn. Ample space for a range of garden furniture etc. External power points. Outside lighting. Seating area and external tap. Rotary clothes dryer. Included in the sale will be the painted wooden shed and composter. 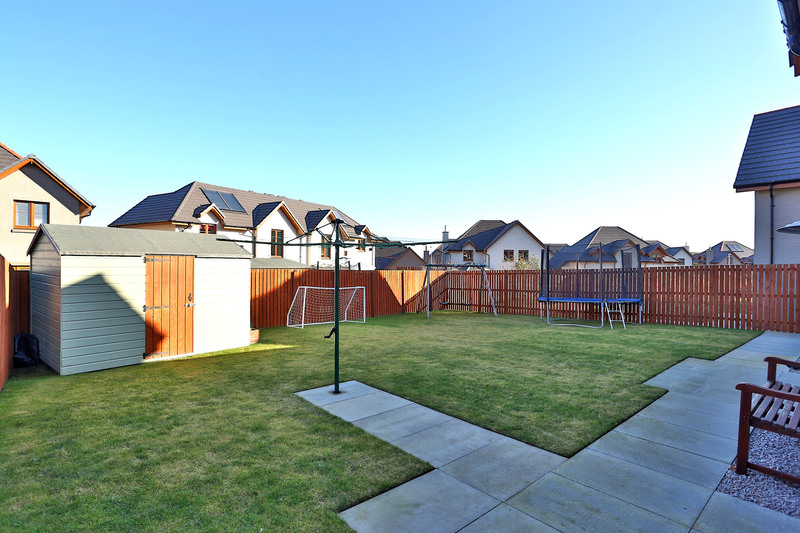 Fencing around the entire rear garden makes it ideal for a family with children and/or pets.